Generally, the web scraping involves messing with webpage source code, dealing with coding, or using APIs. And still, many of these options scrape the whole web page so you end up spending time on finding the desired data elements. In this article, I covered a simple and quick method to extract selected structured data from websites. To do that, I’m going to use Scraper Parsers, a free web scraping tool available as an extension for Google Chrome. This extension lets you choose the data elements that you want to extract and gives you a structured output. It visualizes the data on an interactive chart and lets you download the structured data in XLSX, XLS, XML, and CSV formats. How to Extract Structured Data from a Website? With Scraper Parsers, you can define the data elements that you want to extract from a website. You can simply select the segment by hovering the mouse cursor and label it for ease. Then, this tool collects those data elements from the similar multiple pages of that website. The free version lets you extract 1000 pages per website with no simultaneous extraction. To extract the structured data, simply visit the webpage from where you want to extract. Wait a minute on that page and then click the Parsers icon from the menubar. This opens the Parsers overlay to define the segments which you want to extract. All you have to do is hover your cursor over the segment, and it automatically fetches that and adds that to the selected label. Then, you can enter a name for the label for easy sorting. Similarly, you can add multiple labels for different sections with the Add new Label option. After selecting the desired segments from the webpage, click the Start button from the overlay to begin the data scraping. Once finished, this extension shows you a “view results ” button that takes you to a new tab. In that tab, it shows you the extracted data with options to visualize each label. From here, you can download the extracted structured data as XLSX, XLS, XML, and CSV file. The data in each format is structured as per your selection. 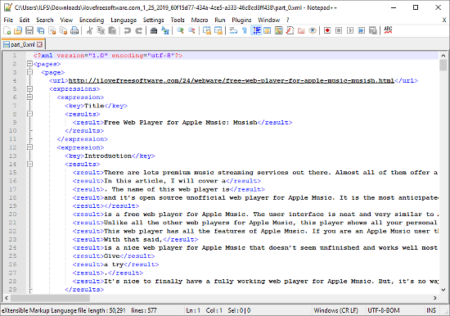 Here is a preview of extracted structured data (XML) from this website. I added 3 labels; title, introduction, and author. 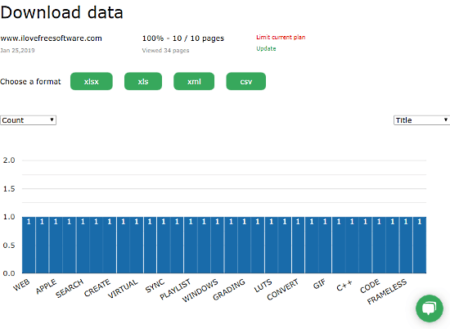 This tool structured the data in that exact order from 10 pages. 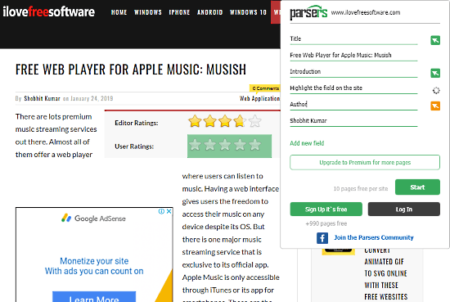 Get Scraper Parsers extension from Chrome Web Store here. Scraper Parsers is a nice tool to extract selected data from websites which can be handy for general and marketing research purposes. It gives makes the output structured so you don’t have to spend any time sorting the data. This way, you can easily extract desired data segments from various types of websites and download the catalogs of products, articles, etc. with the required characteristics.